Ke Apon Ke Por is a Bengali television Soap Opera that premiered on J..
Ekta Kapoor is gearing up to launch the third installment of Televisio.. The story is about the lives of a rich business family in Mumbai, the ..
Janak is the childless King of Mithila. 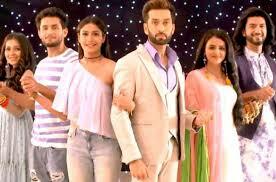 While Mithila has suffered dro..
Naamkaran is a Indian Hindi romantic drama television series, which pr.. In Jhalak Dikhhla Jaa, celebrities perform various dances together wit..
Bengali first HD TV channel Star Jalsha’s upcoming new daily soa..
Kusum Dola is an Indian Bengali show which airs on most popular Bengli..
Khoka, an innocent wrestler from Kusumpur, falls in love with Tori, a ..
Krishndasi is a love story caught in the backdrop of hatred and confli.. The story revolves around the two step-sisters, Swara and Ragini, abbr.. The story starts with Chanakya (Manoj Joshi); who recently had a dream..
Naagin Season 2 (English: Female Snake Season 2) (also known as Naagin..
Suryaputra Karn: The story revolves around one of the central characte..
Potol Kumar Gaanwala follows the journey of a young singing prodigy Po..
Ichhenodi is a story of two sisters, Meghla (Solanki Roy) and Adrija (..
Kolkata Bengali TV Serial Punni Pokor is an upcoming TV shows for Star..
Milon Tithi is a Star Jalsha Indian TV Channel serial, which telecast ..
Bhakter Bhagvaan Shri Krishna star jalsha tv show. The Voice India Kids is an Indian Hindi singing reality competition te.. The story is about two Ichchhadhari Nagin[clarification needed] named ..
New show story is really interesting.Tamanna show is a story about a w..